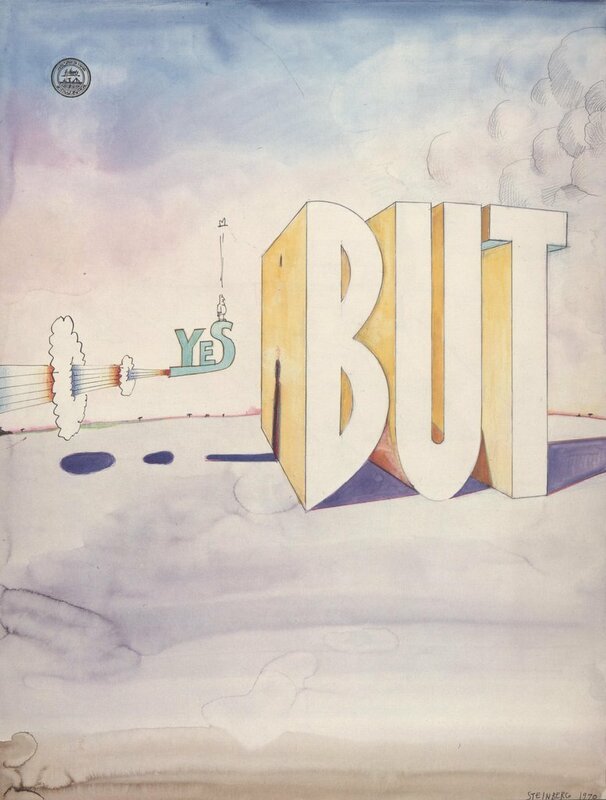 In the whole long clanging pageant of art, no artist ever combined words and pictures the way that Saul Steinberg did. He was truly an original. When Steinberg died, art critic Robert Hughes wrote, "He had no equals. Now he has no successors." The critic and philosopher Harold Rosenberg noted with admiration,"there is only one of his kind." 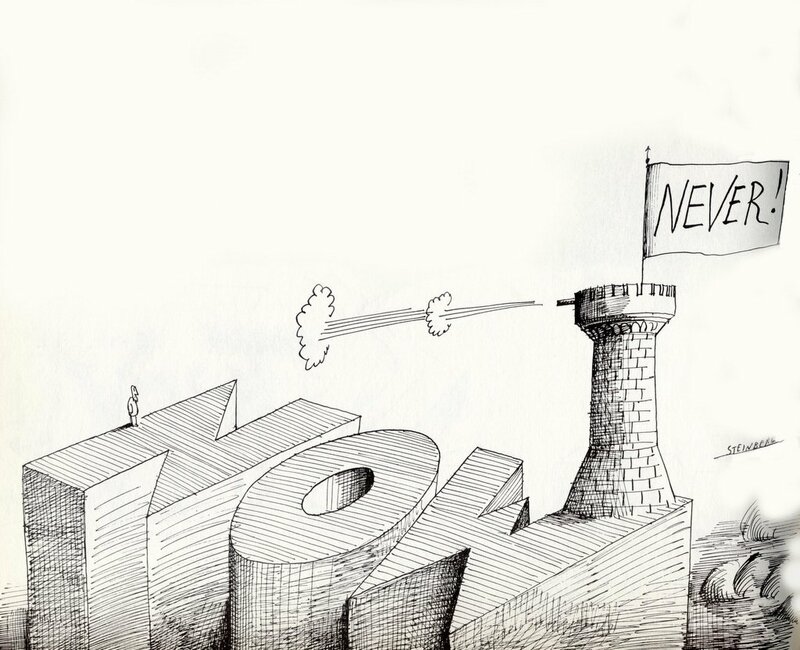 Steinberg dealt with the most immense and challenging issues of the human condition. New York Times art critic John Canaday wrote, "Steinberg is the great artist of the post World War II quarter-century and maybe, for all we know now, the whole latter half-century." 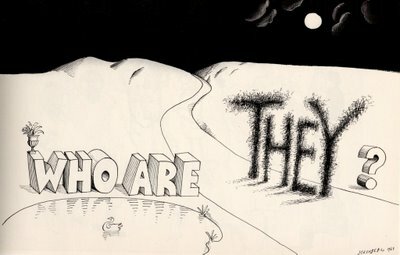 But for all his depth and brilliance, Steinberg had a playful side that showed itself in simple little word pictures like these. 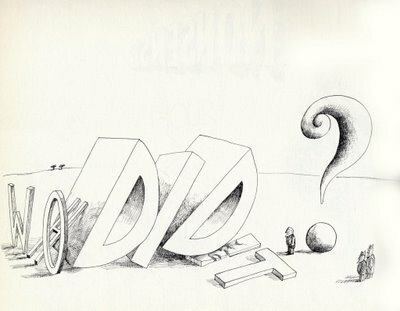 These drawings reveal Steinberg's imagination at the granular level. He was quite capable of constructing elaborate, multi-tiered works of great profundity, but unlike today's image-conscious artists who work with press agents to shape their image and protect the mystery of their creativity, Steinberg was never afraid to put these little drawings on display. To borrow a phrase from Issac Stern, these drawings "make it so simple that you can't cheat." I admire Steinberg as much for his backbone as for his clear artistic gifts. He was never afraid that his playful cartoons would dilute the brand of his museum paintings and sculpture. I have used this blog to disparage "concept artists" who delude themselves that the high falutin' content of their message will redeem their otherwise meager artistic talents. 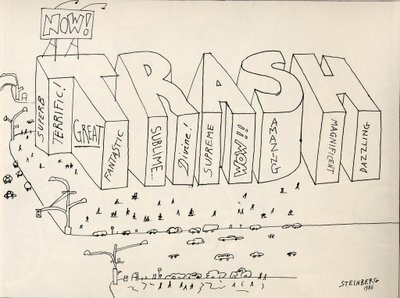 Steinberg is one artist who got it right-- brilliant content married to a strong and excellent visual form. I would argue that George Herriman far surpassed Steinberg in wit, inventiveness, conceptual density, and sheer productivity. Once again, Robert "Thomas Hart Benton wasn't much of a painter" Hughes reveals his ignorance. I love Herriman's work, too-- he is the lyric poet of the comic strip world. I love the fact that his work is so highly personal and eccentric. I love his surrealistic streak. And of course, his drawing was superb. I just view him differently than Steinberg. He is more intuitive, less cerebral. If Herriman was a nightingale, Steinberg was an owl. Whether one surpassed the other depends on whether you prefer nightingales or owls. As a matter of pure math, I think you are wrong about "productivity" but I don't think that is key to the greatness of either artist. In 1992 I was working on a film in Munich for most of that year. Once, having a rare day off, I accompanied an Irish girl to her hotel in the country. We walked most of the afternoon through the countryside to get there. When I entered the hotel, I was struck by the sight of several original Saul Steinberg drawings hanging along the staircase. It was a wonderful suprise to cap off a wonderful afternoon. Not much of a story, but I so rarely get to share it with anyone who can appreciate it. 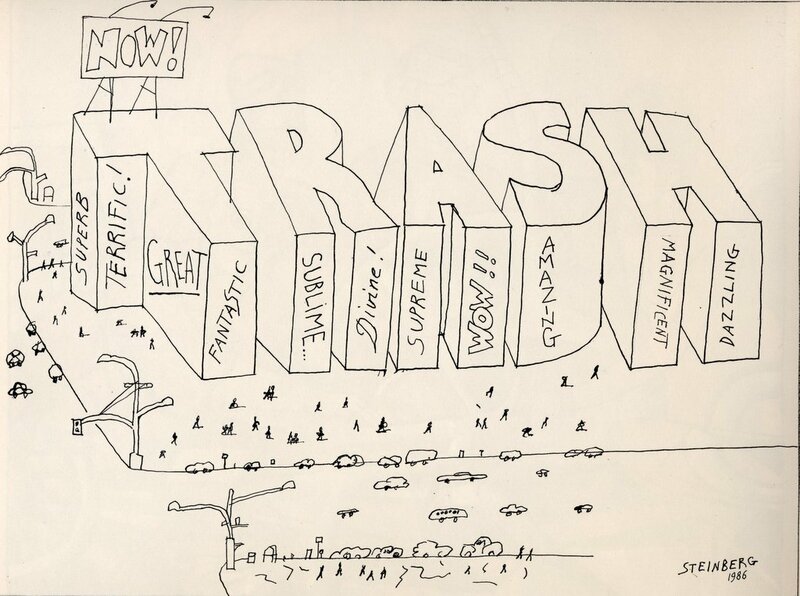 I think, Saul Steinberg is one the art geniuses of his age. He said: "The artist is an educator of artists of the future . . . who are able to understand and in the process of understanding perform unexpected -- the best -- evolutions." I think, this way of thinking makes his art an indispensable source of inspiration for succeeding generations. Such a grand display of phrases and line-art! Picasso, Klee, Kandinsky, Miro and Steinberg...That's it!! thank you! 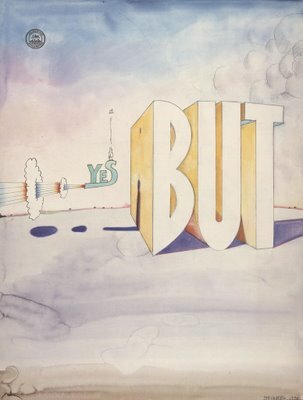 I've been looking for "Yes/BUT" for years, while describing it to uncomprehending listeners. Maybe it was the way I waved my hands. Feared time would run out (I'm in my 80s). Of course, it still will, but at least whoever gets my computer will find "Yes/BUT" among 'favorites'. I adore Steinberg. Many many thanks. Helen.